IBF World Super Featherweight Champion southpaw Tevin “American Idol” Farmer, 29-4-1 (6), defended his title for the third time in five months by defeating southpaw Jono “Celtic Warrior King Kong” Carroll, 16-1-1 (3), of Dublin, IRE, over 12 exciting rounds. It was surprising to see the PA commission allowed Carroll to fight with a full beard. In the first round Farmer gave Carroll a boxing lesson having the jab in an all southpaw match in his face the entire round until the last ten seconds when Carroll landed a combination. In the second round Carroll landed a flurry of punches to the body. Farmer fought Carroll’s round staying inside and getting outworked. In the third round it was an inside brawl from both fighters. Farmer is quicker and referee Rosato is not warning Carroll’s low flows but from a distance motioning keep them up. The fans love the action. In the fourth round Farmer returned to boxing picking Carroll apart and rocking hin with a right hook to the chin. They are going back and forth inside with Farmer getting the best of it. Farmer ended the round with lightning punches to the body and head of Carroll. Carroll laughed going back to the corner. He is a lovable character. In the fifth round Farmer countered Carroll with a left cross on the chin. Carroll is outworking Farmer inside. Farmer knocked out the mouthpiece of Carroll. Farmer is puttin on a show rocking Carroll. Farmer landed a right to the head and a left uppercut to the body. Farmer got warned for a low borderline punch by referee Rosato. In the sixth round Farmer made Carroll miss a variety of punches and came back with a flurry landing every one. Carroll kept coming. Farmer stayed inside slipping punches and rocking Carroll with a left on the chin. Farmer had Carroll missing several punches at the bell. In the seventh round Farmer has Carroll following him and walking into punches. Carroll is touch as nails but Farmer is much slicker. Farmer landed a double left uppercut on the chin. In the eighth round both fighters are landing solid punches all inside. Its all body shots from both fighters. Farmer is landing uppercuts at will. The Irish fans are loud at the end of the rounds but not so loud during the round. In the ninth round Carroll is throwing more but Farmer landed the more effective punches. Carroll has the hart of a lion. Farmer has been playing with him but needed to land more punches. Carroll’s got a cut over his right eye. Farmer is a slickster but you never know how the judges see it. In the ninth round the action is furious. Farmer evades many punches and comes back with solid right hooks on the chin. Carroll is cut over both eyes. Farmer is showing his superior skills. Farmer has Carroll busted up with blood covering his face. Referee Gary Rosato pulled Carroll off as he was trying to land something after the bell in desperation. In the tenth round Carroll’s glove was untied and his corner took too long to take care of it. Farmer is out there having fun as the Celtic Warrior has him against the ropes being desperate but dangerous. In the eleventh round Farmer will slip head shots but Carroll is landing to the body. Farmer is giving him a boxing lesson but Carroll never stops tring. Carroll landed a good body shot but Farmer has him a bloody mess with head shogts. A right hook rocked Carroll. The corner should have stopped it for Carroll. In the twelfth and final round Farmer looks to finish it. He landed a right cross to the chin rocking Carroll. Farmer landed a combination to the head of Carroll having him near exhaustion. Carroll kept fighting back like the warrior he is but he is in with a better fighter tonight. The fans enjoyed this one especially the Philly fans. Scores were 117-110 and 117-111 twice with this writer having it 118-110. The fans loved this one. IBF World Female and WBA World Female Lightweight Champion and 2016 Olympic Gold Medalist Katie Taylor, 13-0 (6), of Bray, IRE, stopped WBO World Female Lightweight Champion Rose “The Queen” Volante, 14-1 (8), of Sao Paulo, BRZ, in a unification match at 1:40 of the ninth round in a war now having three belts. In the first round Volante rushed out landing the first punch. A minute later Taylor dropped her with a flurry of punches for an 8 count of referee Benjy Esteves, Jr. In the second round it was a lot of infighting with both taking the lead. Taylor landed a solid right on the chin but Volante came back with a right of her own driving Taylor into Volante’s corner landing a right to the chin at the bell. In the third round Volante came out pressing Taylor who countered well. The crowd was yelling “come on Katie”. Volante countered a right with a right moving Taylor back several steps. In the fourth round Taylor landed a 3-punch combination to the head and body. Volante has surprised the crowd going punch for punch with the highly respected Taylor. This was another close round. In the fifth round the women are slugging it out to the delight of the fans. Volante looks like she has a bloody nose. In the sixth and seventh rounds the women fought back and forth on even terms. In the eighth round Taylor rocked Volante with a flurry of solid punches to the head. Taylor landed a good left hook to the body. Volante came back forcing the action with a right on the chin. Taylor came right back with a right on the chin. Taylor landed three punches to the head. The fans were chanting “Katie, Katie”! In the ninth round Taylor came out landing a pair of left hooks to the body. Volante came back with a right and got countered with a flurry from Taylor staggering Volante. Taylore landed a pair of left hooks to the body. She followed after a clinch with a flurry of punches to the chin. Volante looked like her nose might be broke as referee Esteves waved it off. The Volante corner did not complain. It was a very good fight from both champions. After eight rounds this writer had Taylor ahead 77-74. Volante had nothing to be ashamed of for she fought like a champ. Taylor is one of the most colorful boxers in the game. Humble and very approachable to the press. Middleweight “King” Gabe Rosado, 24-12-1 (14), of Philadelphia, lost a decision to Maciel “Striczu” Sulecki, 28-1 (11), of Warsaw, POL, for the vacant WBO International Title. In the first round a solid lead right on the chin from Sulecki dropped Rosado who got up on shakey feet. Referee Clark gave him the 8 count. Rosado was able to get through the round. In the second round Sulecki stalked Rosado who countered with a good right on the chin. Both exchanged rights to the chin. Rosado had the Philly crowd yelling and Sulecki had the Polish crowd yelling with red and white flags flying. In the third round both fighters to war with Rosado getting the best of it. Sulecki backed him into a corner with a right to the chin. The fans were really into it. Rosado landed another wild right. In the fourth round Sulecki landed a solid right on the chin. Rosado scores with one right to Sulecki’s three but the fans go wild for Rosado. Rosado landed a right to the chin followed by a right uppercut to the chin. Rosado rocked Sulecki with a right having the fans on their feet. In the fifth round both fighters exchanged solid rights to the chin. Sulecki landed a combination to the chin. Rosado landed a 3-punch combination to the chin. Sulecki landed a hard chopping right on the head. Good and close round. In the sixth round Suleci is pressing the fight but Rosado is outlanding him. Rosado has swelling on his face while Sulecki is unmarked. Rosado has the crowd behind him since his wild introduction. In the seventh round Rosado came out using his jab effectively. He has the faster hands. Rosado rocked Sulecki with a right cross on the chin. Rosado landed an overhand right on the chin making Sulecki smile. Rosado landed an uppercut while the referee was breaking them. Then at the bell landed one slightly after the bell on the chin. 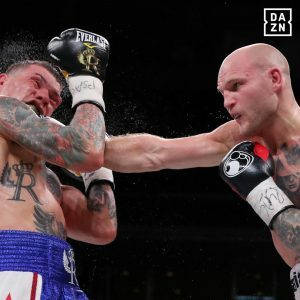 In the eighth round Sulecki landed a straight right on the chin. Rosado started showboating and Sulecki replied with a right to the chin. Sulecki missing two and got hit with a Rosado right. Rosado landed aright uppercut but got countered with a powerful right dropping Rosado on his back for the 8 count. Rosado ran around the ring with his hands up in the air trying to recover. In the ninth round the lead was going back and forth. A right from Rosado dropped Sulecki who got up and got dropped again by Rosado!Rosado hurt Sulecki with a right on the side of the head. Rosado landed two solid punches hurting Sulecki who came back with a right to the chin. The fans were on their feet the entire round. Sulecki clinched and too three hard uppercuts from Rosado on the chin. It turned into a out and out brawl. Rosado won the round and the crowd! Scoring was McKaie and Braslow 95-91 and Carter 95-95 while this writer had it 95-91 Rosado. Rosado can’t catch a break even in this home city. The crowd was stunned with the decision. All of press row but this writer had Sulecki ahead. Demitrius Andrade was in the crowd and told this writer they will fight in June. Lightweight 2016 Olympic Gold Medalist and WBC No. 1 ranked southpaw Cool Hand” Luke Campbell, 20-2 (16), of Yorkshire, UK, stopped Adrian “Chinito” Young, 26-6-2 (2), of Sinaloa, MEX, at 1:37 of the fifth round. In the first round it was all Campbell until halfway through. Young became the aggressor the second half with Campbell wining the round. In the third round Campbell countered well but Young kept coming holding his own. In the fourth round Campbell landed a hard straight left on the chin. He followed with a right uppercut to the chin dropping Young for the 8 count. Campbell landed a pair of lefts to the chin just prior to the bell. In round five Campbell took over landing punch after punch while Young was cut over the left eye. Young landed his one and only punch a good right on the chin. Campbell landed a flurry of punches driving Young into the ropes reeling until referee Dali wisely called a halt. The UK fans went wild! Debuting Raymond “Savage” Ford, 1-0 (0), of Camden, NJ, made an impressive debut defeating a game Weusi Johnson, 3-11 (0), of Wilmington, DE, over 4 rounds. In the first round an overhand left from southpaw Ford dropped Johnson for the 8 count by referee Gary Rosato. Johnson held his own surviving the round. Ford signed by Matchroom and a former National GG champion wanted to impress and did in the round. In round two Ford continued with more punches until Johnson came back quite well. Johnson being a late sub but coming off a win. In the third round Ford and Johnson fought it out well. It was a close round with Ford getting the edge. In the fourth and final round Johnson knowing he needs a knockdown chases Ford. Ford landed a solid left to the chin that Johnson walked into. Ford seemed content to take the decision. Scores were 39-36 by all 3 judges. This writer had it 40-35. Welterweight 2016 Olympic Gold Medalist southpaw Danivar Yeleussinov, 6-0 (3), of KAZ, out of Brooklyn, NY, defeated Silverio Ortiz, 37-24 (18), of Yucatan, MEX, over 8 rounds. In the first round Ortiz landed the first punch a right to the chin. Yeleussinov came right back with a combination to the chin. Then landed a hard right hook to the head. In round two Yeleussinov backed Ortriz against the ropes with a flurry of body shots. Ortiz landed a right to the chin getting off the ropes. Another close round. In the third round Yeleussinov backed up against the ropes countering Ortiz with jabs and lefts to the chin. Ortiz is walking into punches trying to catch Yeleussinov. In the fourth round Yeleussinov warned for low punch by referee Benjy Esteves, Jr. Yeleussinov landed a hard left uppercut to the chin. Ortiz chased him the entire round. In the fifth round Yeleussinov was dishing out wicked body punches. Ortiz halfway through the round landed a solid right to the chin. Yeleussinov worked the body for the most part. In the sixth round Yeleussinov would land three punches and Ortiz come back with one. Ortiz got a second warning for hitting behind the head. It was an entire round of in fighting. In the seventh round Yeleussinov landed a powerful left on the head of a ducking Ortiz knocking him to the canvas but landed a punch while Ortiz was down. Referee Esteves is giving Ortiz all the time he needs to recover. The referee deducted a point from Yeleussinov. It turned into a brawl with inside fighting. Ortiz rocked Yeleussinov with a overhand right to the chin as the bell sounded. Ortiz pounded his chest. In the eighth and final round Ortiz landed a solid right to the chin. Seconds later Ortiz landed a left hook to the chin. Knowing he is way behind he is looking to pull it out with a knockout but Yeleussinov had too much power for him to overcome. Scores were 79-71 and 79-72 twice. This writer had it 79-71. Lightweight Hank Lundy, 29-8-1 (14), of Philadelphia, lost a majority decision to Avery Sparrow, 10-1 (3), of Philadelphia, over 10 rounds of nothing but action! A Peltz Boxing rematch in the making! In the first Sparrow landed the first hard punch a right on the chin. Luindy landed a hard left hook to the dhin having Sparrow against the ropes. sparrow came back seconds later landing a right on the chin. Sparrow is a much better defensive fighter but got tagged with a right and left hook on the chin seconds before the end of the round. In the third round Sparrow ducked into a Lundy left hook to the body. Lundy was missing everything but a good jab. Avery landed the final punch of the round a lead right to the chin. In the fourth round Lundy missed with a wild left hook as Sparrow stepped to the side of it. Both are showing respect for one another only throwing jabs. Sparrow landed a right to the chin. Lundy came back missing three punches. It was a close round. In the fifth round Sparrow landed a left hook to the chin and a right to the body. Lundy continues pressing the fight. He had good body work. 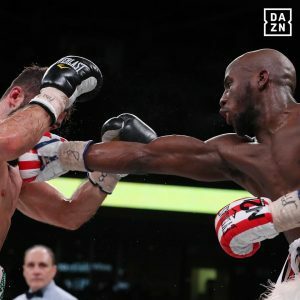 In the sixth round Sparrow rocked Lundy with a right to the chin. Lundy works the body when inside while Sparros counters with a right to the chin. Sparrow landed a right to the chin and a left to the body. Both boxers talked to one another at the bell while referee Clark got between them. In the seventh round Lundy flurried to the body backing Sparrow up. Lundy showed some of his defensive skills making Sparrow miss several punches. Sparrow landed the final punch a right on the chin In the eighth round both take turns pressing ahead. Sparrow landed a triple jab on the chin. Sparrow landed a right uppercut to the chin. Lundy turned southpaw which is his natural. In the ninth round Lundy missed an overhand right but followed through with a left hook to the body. Sparros landed a lead right to the chin. Lundy landed a left hook to the chin. Sparrow landed a right to the chin. Lundy landing hard body shots. Sparrow landed the final punch a right to the chin. In the tenth and final round Lundy warned for hitting behind the head by referee Clark. Sparrow missed with two punches but the third landed on the chin. Lundy landed a left hook to the chin. Both were throwing punches at the bell. This one lived up to the build up. Scores were LaRosa 94-94, Worling 96-92 and Braslow 95-93 as did this writer have it. D’Mitrius “Big Meech” Ballard, 20-0 (13), of Temple Hills, MD, stopped Victor “Sina” Fonseca, at 2:11 of the fifth round in a scheduled 10. In the first round after a minute Fonseca landed a pair of rights to the rib cage. Ballard landed a chopping right while inside. Fonseca pushed Ballard against the ropes with a pair of body shots. Ballard landed a right uppercut on the chin at the ten second warning. In the second round both fighters mixed it up well. This is a rematch from when Ballard had stopped Fonseca earlier in their career. In the third round Ballard landeded a 3-punch combination to the body. He is opening up this round. Again a 3-punch combination to he body and head. Fonseca went back to his corner pretty well beaten but it only takes one punch in this game to come back. In the fourth round Ballard picked up where he left off. There is no quit in Fonseca. Ballard landing hard right uppercuts looking for a knockout. In the fifth round Fonseca is out landing Ballard until a Ballard low punch hurt Fonseca. Referee Eric Dali is giving him time to re-cooperate. Ballard continues to come forward working the body. A right on the chin and a left hook to the body hurt Fonseca. Fonseca came back with a overhand right on the chin. Referee Dali wisely called a halt after two minutes into the round Fonseca walked back to his corner spitting out his mouthpiece.